Recently, my Altimeter Group colleague Charlene Li and I published an ebook that revealed The Seven Success Factors of Social Business Strategy. To our pleasant surprise, the industry didn’t just react with positive feedback, but also with fantastic infographics that brought the core of the book to life. I wanted to share a few with you here. Over the years, we studied businesses endeavoring to master social media at various stages. We detailed our findings in our research report uncovering that the most organizations evolve through six distinct stages on their way to social business transformation. After release, we went back through our analysis and found that businesses near or at the sixth stage of evolution collectively shared seven success factors that assisted or expedited advancement. As a result, our book played out less like a traditional business book and instead detailed the DNA of successful businesses as a reference guide, point by point, how each took the next step, and also featured stories and advice from the most advanced companies we could find. It’s the approachability of the seven strategic factors that seemed to resonate with readers. And to be honest, the same factors can apply to the approach of any important business strategy. The first infographic I would like to share with you was developed by good friend Vala Afshar (@valaafshar). Recently, Mark Smiciklas (@intersection1) dissected the success factors and explored the very essence of each. He found that these seven factors were indeed seven genetic markers that compiled into the DNA of a successful social business. In his post at Social Media Explorer, Smiciklas tied the seven factors to narrative gives you an at-a-glance view of your next steps, “Using a blend of research and real world client data, Solis and Li have established a social business strategy DNA – a set of strategic characteristics that are common among successful social organizations. Finally, I would like to share with you a visualization all the way from The Netherlands by Alexis van Dam. Unlike an infographic, van Dam created an in-depth mind map that outlines each success factor and the corresponding details of each. Great points raised, guys! It’s always a daunting task to implement a corporate-level Social Media strategy from the ground up. You’ve got to identify your own company branding, goals for taking these steps (more sales, PR, keeping up with the times), and identify who can carry it out. It’s a tall order, to be sure! All these graphics are such a good reminder of how a customer community is the best source a marketer/business has for finding researchers, innovators, and sales-people. It’s so easy to think of customers as static audiences, instead of the dynamic community they really are. As always I take the message and try to distill it from a small business perspective. In this case it is a matter of scale. The first two items are important for any business regardless of size. The third is commitment on the part of the business owner. A strategic roadmap would involve research to find the one social platform where that businesses customers most often hangout. The governance and guidelines are critical to making a social program work for small business. Since most small business owners are the person to implement the program, having guidelines that keep them focused, efficient, and consistent is key. Evolving technology for small business owners is the shiny object syndrome. There is ALWAYS something new, different, and better. It’s a fine balance between using what works and being open to something that works better. Thank you Steve. Great comment! Stellar infographics and information. Social is just part and parcel to marketing now. If people don’t integrate it soon, they’ll fall further and further away the more social evolves. 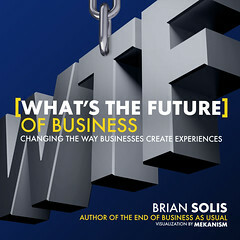 It’s way beyond time for businesses to embrace it.